A weak US Dollar and rising oil prices help the loonie. Monthly Canadian GDP and the Fed decision stand out. The technical picture is bearish but the FX Poll points to the upside. NAFTA negotiations resumed between Canadian Foreign Minister Chrystia Freeland and USTR Robert Lighthizer and their teams. There were no breakthroughs. US Representative Scalise said that time is running out while Canadian PM Justin Trudeau repeated that no deal is better than a bad deal. However, markets have already accepted that the US-Canadian talks may take quite some time. The mood also remained optimistic despite the official US announcement on new tariffs on China. The 10% duty will be slapped on $200 billion worth of Chinese goods. The relatively low tariffs rate and the moderate response from China helped soothe investors. The upbeat market mood pushed the US Dollar lower across the board, and the loonie, a risk currency, took advantage of it. Also, the C$ was buoyed by higher oil prices. 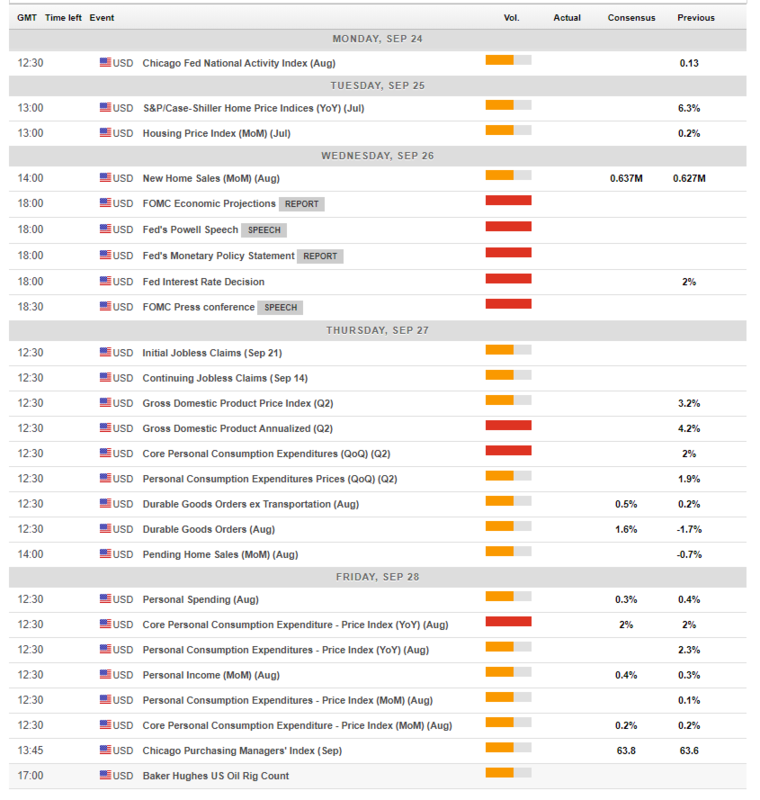 A relatively light week awaits Canadian traders. The central fact is the publication of the Gross Domestic Product report for July, the first publication for Q3. June's monthly figure disappointed by remaining flat. Other events should have a minor effect on the C$. The Canadian Dollar is also set to move on NAFTA headlines, but these will need to be more dramatic for a meaningful market movement. This consists of a total failure of the talks or reports of an imminent deal. The recent rhetoric about constructive discussions and differences that need to be gapped are not inspiring considerable movements. Oil prices have had their influence and may continue doing so if crude breaks out of the recent ranges. The Federal Reserve decision is left, right and center. The Fed is expected to raise rates in this September meeting and confirm the path for a fourth rate hike in 2018 in December. A bigger question remains for the future: will the Fed set the interest rate above inflation or leave it neutral? Recent comments have been quite hawkish. The dot-plot is the first source of market movement. It is followed by the statement and culminates in Fed Chair Jerome Powell's press conference. 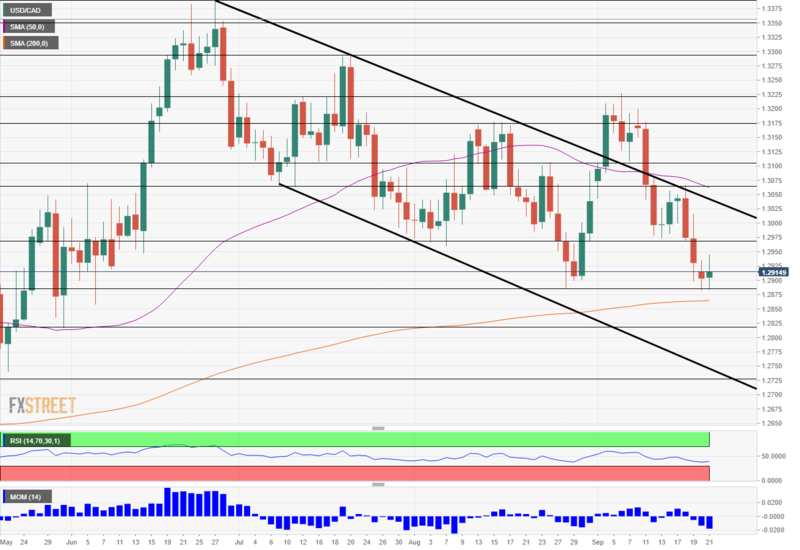 All in all, a hawkish tone will likely allow the greenback to make a comeback while a dovish one may trigger further losses. On Thursday, the US publishes its final GDP report for Q2. The second release saw an upgrade to 4.2% annualized, a robust pace. In parallel, the US announces the Durable Goods Orders publication for August, timely update on investment and a key for Q3 GDP. A bounce back is on the cards after a weak report in July. Last but not least, the Fed's favorite inflation measure is expected to slide in August. The Core PCE is projected to follow the footsteps of the Core CPI and slow down. Other figures such as Personal Consumption and Personal Spending will likely point to ongoing growth. Apart from the Fed and the indicators, any new developments on trade will be of interest. The implementation of the new tariffs takes place on September 24th, and headlines could trigger action. The USD/CAD is now trading at the lower ground but still enjoys the support of the 200-day Simple Moving Average. It trades below the 50-day one. The Relative Strength Index is negative, and Momentum is to the downside. The pair returned to the broad downtrend channel that characterized it earlier in the summer. Support awaits at 1.2880 which provided support in September and earlier in late August. Lower, 1.2820 was a swing low back in May. 1.2730 was also a trough in early May. Looking up, 1.2970 was a line of support before the recent slide. 1.3060 capped the pair in mid-September. Further above, 1.3100 was a support line in September before the USD/CAD dropped to recent levels. It is hard to see the Canadian Dollar continuing its winning streak. There is a low chance that a NAFTA deal will be reached before the mid-term elections and a hawkish Fed will likely boost the greenback. A surprisingly strong GDP report and a climb in crude prices could support the Canadian Dollar. 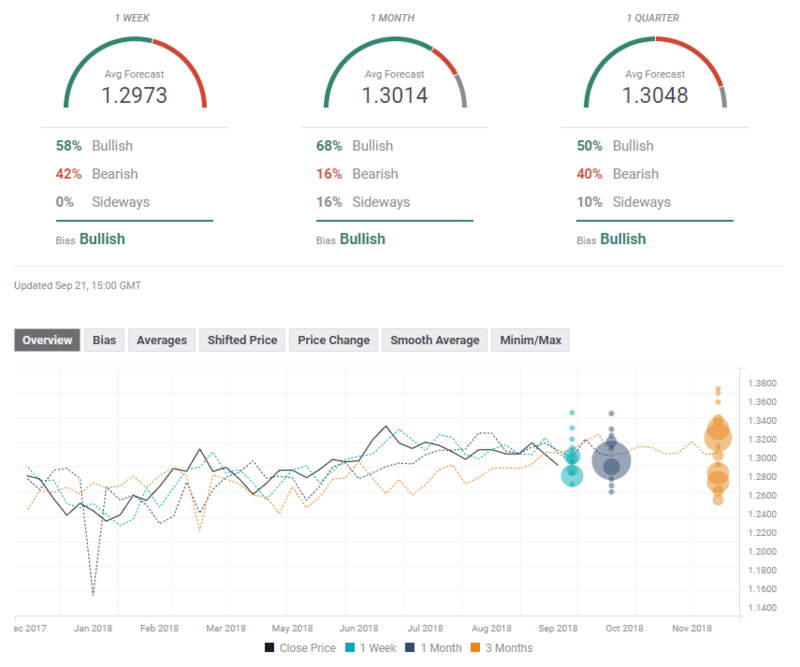 The FXStreet forex poll of experts provides shows a bullish tendency on all timeframes but forecasts have been slightly modified to the downside.